You may have noted the double-set of credits on the cover – that’s because the Mexican Superman comic contains the stories from both the U.S. Superman and Action Comics series, which I thought was interesting. 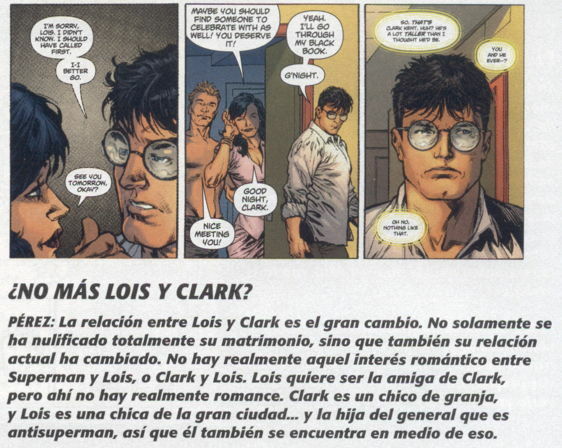 For some reason, reading “No More Lois and Clark?” in Spanish makes it seem even more…dramatic, somehow? I can hear “no mas Lois y Clark?” being breathlessly declared in a telenovela commercial. And believe you me, I’ve seen my fair share of telenovelas. Anyway, like I noted last time, the production values on these are pretty high…slick, thick covers, nice white paper interiors. What few ads there are seem to be house ads or ads for comic-related merchandise (save for a Ticketmaster ad for upcoming rock concerts). And it should probably be noted that one of the Avengers issues I received, Secret Avengers , contained two issues of that series. 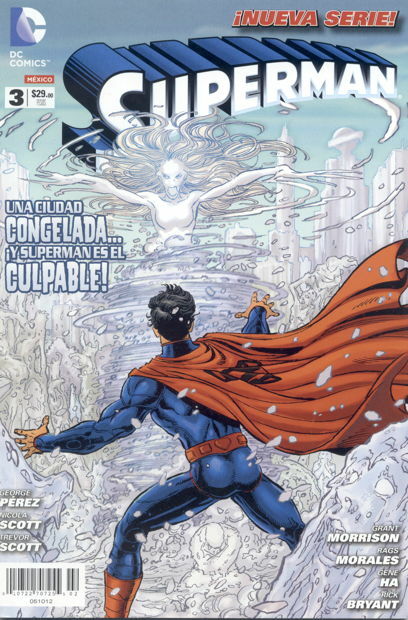 ALSO NOTE: “anti-Superman” is pretty much the same in Spanish as in English. Such unfortunate sentiments need no translation, apparently. I’ve been saying for years that Superman is a chico de granja, but nobody would believe me. At last, I feel vindicated. Thank you, Mike Sterling’s girlfriend. If the word balloons are in English…. why, um, have the rest of the text be in Spanish? If the idea is that someone could follow the story well enough in English, what is the reason to switch back to Spanish? Shouldn’t it be an all-or-nothing kind of deal? … I have no doubt I’m missing something here, but for the life of me, I can’t see it. Alex – The bits of art used to accompany the text pieces in the back of the book weren’t translated into Spanish. A pal of mine brought me an Italian Superman comic that included reprints of the #1 issues of the “new” Superman, Action, Superboy and Supergirl. The cover stock was crazy thick and the whole package was really nicely put together. I don’t read a word of Italian, but it’s a fun book to have anyway. The opening to the George Reeves Superman series, dubbed into Spanish in Puerto Rico (and the same version was aired on TV in Mexico and other Latin American countries), as narrated by Cuban radio announcer/poet Jorge Raúl Guerrero. Ah, now I get it. I didn’t put it together that those panels were just little recap-type things in the back of the comic and not actual story content from the issue. D’oh. UK newsstand versions usually double up on issues too; for example the Batman reprints have both Batman and (IIRC) Detective Comics in the monthly issue, released about ten months after the US direct market versions. Interestingly enough at WH Smith (the UK’s biggest newsagent chain), they left the whole Joker face removal thing unedited, despite it being in with the comics aimed at four-year olds. Great stuff! No Swampy in Mexico,eh? Mike, if you want something to brighten your day, just tell me where to send it. I’m serious. Recuerdos desde España(That’s in Europe, dudes! ).